MOST instructor Steve Speed discusses the value of a positive reputation. 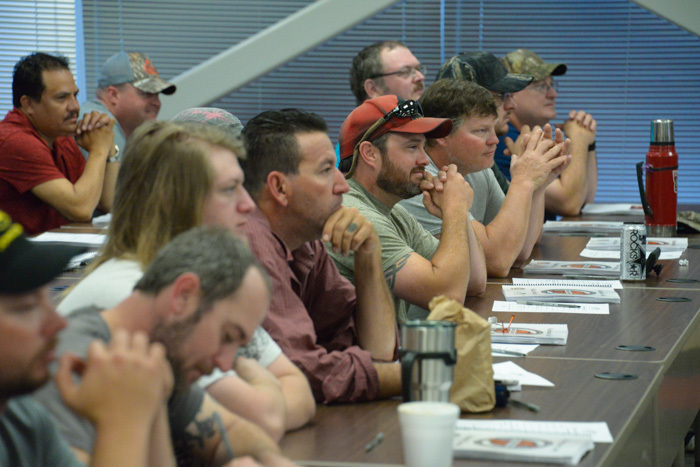 Members listen attentively at one of four Boilermaker Code classes held at the Plant Vogtle nuclear power station in April. L-26 BM-ST Johnathon Bates discusses Department of Labor jobsite harassment guidelines. Members enjoy an anecdotal story from MOST Code trainer Steve Speed. 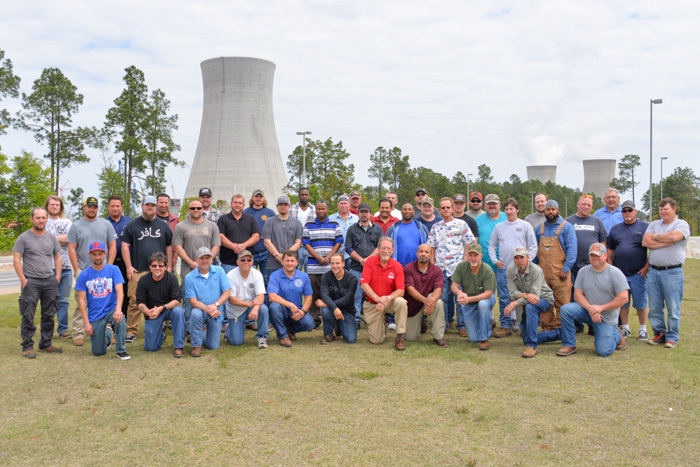 Members attending the first of four Boilermaker Code classes at Plant Vogtle assemble for a photo with the nuclear power station’s cooling towers in the background. 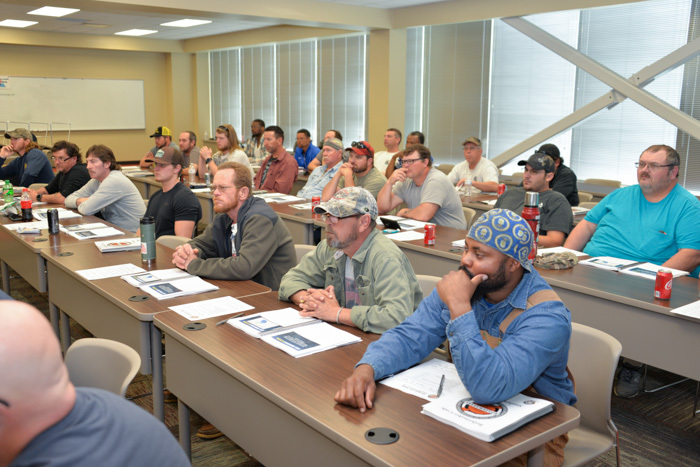 Members attending one of four Boilermaker Code classes at Plant Vogtle. A total of 192 members representing 26 locals from across the United States completed the training. Georgia Power, a subsidiary of Southern Company, allowed access to classroom facilities at the project site. 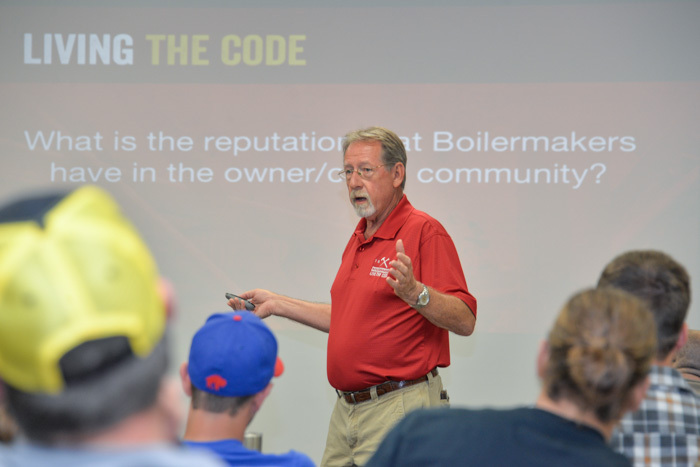 The Boilermaker Code is the newest of 17 MOST programs. 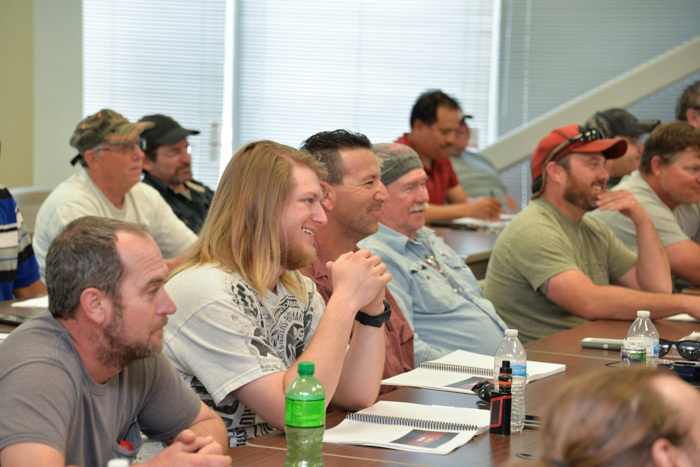 Through extensive use of video interviews and jobsite reenactments, the program teaches members the value of performing professionally on the job and the cost of unprofessional behavior to the contractor trying to earn a profit, to the owner trying to complete a project on schedule and on budget, and to the Boilermaker whose ability to get future work depends on a solid reputation. Local 1: Clinton R. Mann. Local 5 Zone 7: Joseph J. Cich Jr., Jared D. Hite and Michael J. Meister. Local 5 Zone 175: Andrew P. Fultz. Local 26: Jose Luis Acevedo, Jaime Alvarez, Austin Ashley, James Bailey, Johnathon M. Bates, Grant Baxter, Jahmal Bellinger, Glen Birkheimer, Barbara J. Bolton, Herschel A. Brown, Ryan Brown, Reginald D. Bryant, Jimmy P. Byrd, Jacob Carach, Al Carr, Morgan D. Castle, Paul S. Christie, Jimmy M. Clark, Dylan G. Cook, Ryan A. Coxwell, Dennis E. Crews, Demarcus Cunningham, Wayne Curl, Lannis Deal, Jaye Denson, Kelly Douberly, Cecil Dunlap, Charles M. Durden, Brennan P. Eason, Andrew B. Edenfield, Michael R. Elliott, Daniel L. Fennell, Rufus Fienagha, Herman Gibbs, William G. Gillis, Joseph E. Glisson, James Derry Griffin Jr., Lewis R. Grimm III, Dustin Hall, John K. Harduick, Jacob D. Harrison, Jonathan Hattaway, Jacob C. Henderson, Bobby E. Hightower, Timothy V. Hipps, Charles Hopkins, Cecil D. Howell, Tracy N. Howell, Jonathan Hullander, Brenden L. Jiles, Joshua Johns, Gordon L. Johnson, Issac Johnson Jr., Raymond K. Jordan, Buddy Kersey, Joel T. Kipfer, Rob Knowles, Jessie J. Lee, Richard R. Long, Larry Lucas, Gilbert Pete Lynch, Fielding L. McClain, Zack Metts, Loyd H. Moreland, Cody L. Morris, William A. Morris Jr., Travis Nielsen, Richard E. Pennington Jr., Devin Pierce, Timothy Piercy, David Pierron Jr., Keith Powell, Samuel L. Prescott, Arnold D. Purcell, Kathleen Raynor, Mark Reuter, Chevy Rigdon, Eric Rigdon, Thomas Rodman, William R. Sanders, Brian K. Saslona Jr., James Schul, Charles C. Sellers II, Kelvin Shannon, Ryder W. Sloan, William T. Smallwood, Crantford E. Smith Jr., Joshua W. Sparks, Darrell S. Summerall, Vandon B. Tanner, James Taylor III, James D. Thrift, Matthew Tracy, Alexander Walicke, Darrin F. Walker, Jacob A. Webb, Todd Wilcox, Thomas W. Williamson, Joseph Wilson, Joel Winkles, Danny Wommack, Jacob A. Wright, Charles M. Youmans and Devin Zeigler. Local 37: James D. Cook, Zachary Hardesty, David W. Miller and Ethan W. Turner. 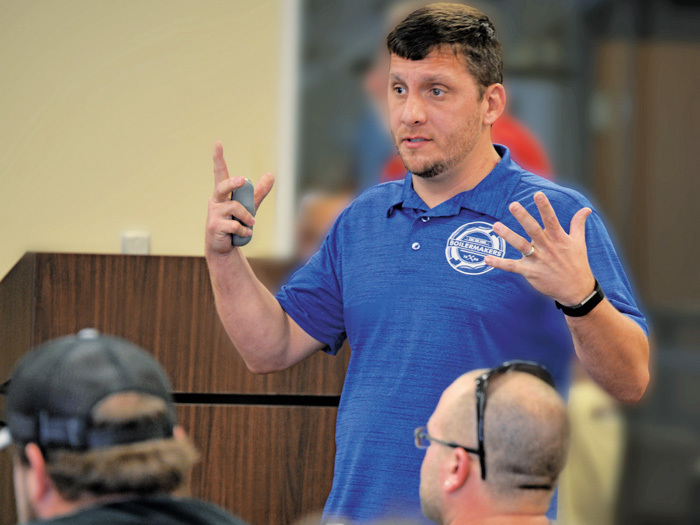 Local 40: Jason S. Kramm. Local 69: Jerry T. Collier and Jonathan L. Woodall. Local 83: Elmer D. Dorrough and Derrick Roberts. Local 85: Kevin L. Bowland. Local 92: Jose H. Gomez and Tracy Rickard. Local 105: Larry Hall, Christopher J. Herman and Jordan Herman. Local 107: Eze S. Boyer. Local 108: Shannon Ballard, James Barnes, William C. Brasher, Mitchell W. Davis, Sheila T. Davis, Michael D. Fuller, Robert Green, Michael J. Huffstutler, William W. Jackson Jr., Jatory K. McCann, Jacob M. Shiflet, Shane L. Stinson, Brandon Strange, Michael G. Tapp and Michael T. Wilkinson. Local 110: Jerry A. Brooks. Local 154: Thomas J. Deptola and Ricki Elliott. Local 169: Wyatt P. Miel, Patrick T. Ridge, Stephen D. Romager and Daniel L. Taylor. Local 363: Darrell Cox, Samuel R. Pierce and Londos L. Smith III. Local 374: John Brewer and Richard J. Zeese Jr.
Local 433: Kenneth Q. Connell, Patricia L. Green, Kenneth S. Hudson, Chad Hughes, Charles R. Knotts Jr., Scott J. Lundberg and Richard M. Vracar. Local 454: Roger L. Bradford, Ralph J. Johnson, David H. Lanier, Bradley K. McKenzie, Isaac N. Price, Jonathan Reese and Stephen Zukowski. Local 455: Francisco Javier Cervantes, Lorinda M. Finch (Bayer), Mike L. Finch, Charles K. Hill III, Matthew C. Slonaker and Jeremy W. Smith. 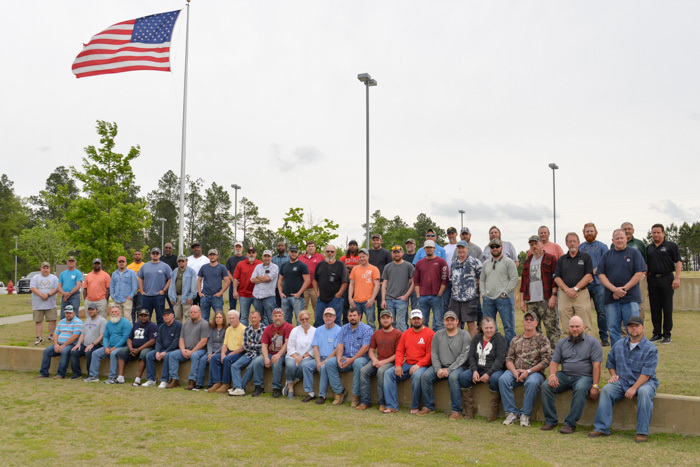 Local 456: Joseph T. Barnes, Christopher A. Bates, Todd E. Blankenship, Riley T. Butts, Lafayette Chavis, Ryan D. Frank, Christopher B. Harvell, Brandon Hayes, Matthew J. Josephson, James Ryan King, Kevin McCartney, Lonnie D. Mosher, Chris Perdue and Jose Santibanez. Local 627: Donnie Chavez and Daniel N. Deen. Local 647: Brian Ashmore and Robert Mewha. Local 744: Charles J. Schlegel.